In his diary Captain Henry North Grant Bushby1 gives a first hand account of a fire in Number 6, Maidenhead Street. Bushby was inside the building when the fire broke out. He also writes about the resultant Court of Inquiry. To Orderly Room, 6 Maidenhead St at 9.55 A.M. There were C.S.M. Dawes, CQSM Howard & Cpl. Gloven in room. At 10. A.M. Lt. De Laloabere arrived. A little before 11 AM, Pte Eaton (my batman, then acting orderly) came upstairs and said “The house is on fire.” We got up & saw smoke coming through the floor. I got hold of my cap, gloves, stick & the locked tin deed box containing cash & a/c books &c, &c and went down & out. The rest did the same, but apparently only Dawes took anything with him – some vouchers. There was no possibility of going back. Outside I met Pte Eaton, who said “I saw the owner (Thomas) go into the shop just before the fire. He was only in there 2 or 3 minutes.” Thomas kept a haberdashery shop under the first floor where our O. Room &c were. The whole house was a ramshackle concern. After 5 or 10 minutes a fire waggon with hose came up, & some firemen began playing began playing water on – with no effect. The fire seemed to be burning fiercely in two separate places at least. I watched it till 12.30 P.M. by which time the roof was burst through & the whole street gutted. A second hose had been brought to bear meanwhile – possibly a third. The water seemed to have no effect at all, and the fire was most fierce. But it seemed when the roof fell that the worst was over, & I came away. At 2.30 P.M. I returned. The fire was under. So was the entire house. Clouds of steam were rising, and the large crowd was being kept away by soldiers. Work all day arranging Court of Inquiry, writing reports, letters & indents. To School of Instruction at 9.15 A.M. Interviewed Lt Martin – a very tall officer – as to Court of Inquiry tomorrow. In afternoon the O/i/c Barracks from Bishops Stortford called to inspect proposed new O. Room, 2 Bull Plain. He then camt to my rooms & stayed till 4.30 P.M. Much letter writing. Interviewed Sptdt. Of Police as to Court of Inquiry tomorrow. Court of Inquiry convened by Major Jim H J Delves Burnghtoz Bt. Reel of cotton worn at night (hot time) sewn in at back to prevent snoring. Told next morning that nobody had heard snores in adjacent room. 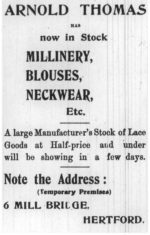 As was his usual custom at around a quarter to eleven Mr. Thomas who lived in Ware Road, had called at the shop to pick up and read his letters. Mr. Thomas and his daughter continued on to the Baptist Church. No sooner had he arrived at the Church than a messanger arrived to say that his shop was on fire. P.S. Palmer had been talking to someone in Maidenhead Street when he had smelt smoke and discovered that number 6 was on fire. In a short space of time flames were shooting through the roof, in four directions, involving the premises of Messrs Hilton’s booteries; Messrs Nelson and Co’s meat shop; an empty garage formerly used as a cinema; some cottages in Dolphin Yard ; and the large premises formerly occupied by Messr. 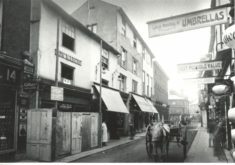 Rayment and Son which have frontage on both Maidenhead Street and Bull Plain. Hertford fire brigade got to work with four hoses connected to the mains. The engine was connected to River Lee near The Barge Inn and provided two hoses to attack the fire at the rear via Dolphin Yard. Even so the fire spread with great rapidity. Ware fire brigade, arriving promptly, was able to stop the spread of the fire to any further premises on that side of Bull Plain. Soldiers with guns and the police were deployed to stop all entrances to Maidenhead Street and Bull Plain and kept back the extensive crowd which quickly formed so that the efforts of the firemen were not hampered and that falling masonry did not injure any members of the crowd. 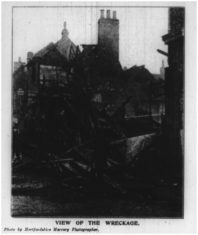 A north-easterly breeze was blowing and the flames travelled across the road scorching the fronts and braking almost all the plate-glass windows at the premises of the Old Coffe house, the Old Empire Meat stores, and J. Cooper & Sons’ Iornmongery establishment opposite. As the firemen were getting the fire “well in hand”, Captain Pamphillon received notice that the roofs of Messrs. Walker’s stores, 50 yards down the road as well as Messrs. Cooper’s opposite were alight. These were quickly doused. The breeze carried burning debris onto the roof of Illott’s mill, 200 yards away in The Wash setting alight rubbish in the gutter. This was promptly extinguished by Mr. Illott. A summer house near the Castle Cinema and a yew tree in the Castle Grounds were slightly damaged. 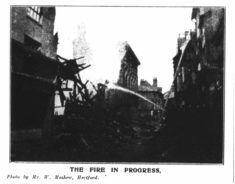 The Hatfield Fire Brigade arrived with its motor tractor and steamer along with a manual engine from the Great Eastern Railway Company and these were quickly brought into action, a plentiful supply of water being obtained from the river. Nearly one hundred people were now being deployed and with great effort managed to bring the outbrake under control. Men scaled ladders and climbed over roofs “like squirrels” to continue to attack the outbrake. Soldiers kindly removed furniture from the cottages in Dolphin Yard since these buildings were in danger of being engulfed in the fire. In subsequent days residents of The Wash and Maidenhead Street as well as Dolphin Yard removed more furniture to a safer location. The buildings were chiefly composed of lath and plaster and along with the combustible nature of the contents there was little chance of saving the buildings themselves. The aim was to limit the damage to adjoining buildings which were also of ancient construction and densely packed together. The firemen used “courage, smartness and precision” to control the outbrake. It was necessary for some firemen to stay at the site until Monday evening to damp down occasional, minor outbrakes. In Dolphin Yard there was a large telephone post which was charred and the wires at its top damaged. The following day two men perched at the top of the post making good the repairs with the post swaying “about in a particulary unpleasant manner”. Presumably this gave the local citizens some amusement in the disastrous situation. 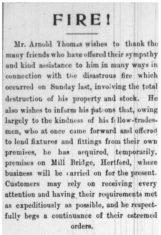 Remarkably Mr. Thomas was back in business within a few days situated at 6, Mill Bridge. This page was added on 31/01/2019.